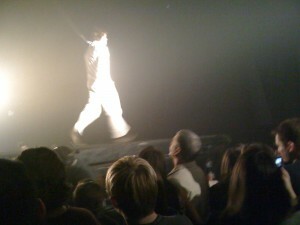 Fuerzabruta (Brute Force) is a show brought to us by the people who created the acclaimed De La Guarda show. I have been to numerous shows in Las Vegas, New York, Orlando, France and Bangkok. Some of them were superlative but after a certain point of time it was difficult to get enthralled since it was the “ been there, done that” syndrome. So when I did enjoy Fuerzabruta at the Daryl Roth Theatre in New York City, I was happy. There is a novelty in the show and it oozes creativity. The high energy and stunning visuals would enthrall anybody. The theatre itself looks and feels old. Upon entering one is led to the basement where there is a Lounge, coat check and restrooms. The coat check charges $2 (cash) per coat. The lounge is called D-Lounge. It’s a small place – snug enough to grab a drink while waiting for the show. About twenty – thirty minutes before the show people are led up a short flight of stairs to a dark abyss of a “hall”. Since it was dark with some spot lighting we couldn’t make out the extant of the hall. We had to stand within a circle drawn on the floor. The techno music is on and once inside people instinctively start swaying to the music. The music slowly increases in tempo. The audience is required to stand for the duration of the 70 minute show. And there is no specific place to stand – we would be moving about on the floor space as directed by the crew members. The Fuerzabruta show starts with a man running on an elevated 6 foot high giant treadmill which emerges out of nowhere and moves into the middle of the hall dividing the audience into two sections. The man runs through doors, through stacked cardboard boxes et al. He gets shot, drops down and after a pause regains strength and runs again. The lighting and music accompanying this gives it the aura of a show. Other cast members and several chairs too join him on the treadmill – all of which fall flat at the other end. The show continues with various acts – a couple of women suspended above moves along a huge curtain (20 feet high curtain) from end to end after the humungous curtain had just encircled the audience; a huge silver dish like structure comes in with a woman on one side and a man on the other. The dish swirls around flinging the tethered humans on either side. 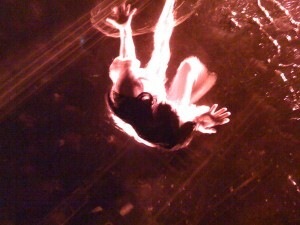 A suspended square see-through pool with a single female inside (in a thin layer of water) and a man outside opposite her gives a sensuous and colorful performance. All the while the audience would be looking up. The highlight is a suspended see-through giant pool which is lowered to about just inches from one’s face. It contains a thin layer of water with four women sliding all over it in various formations. It is visually stunning and indeed a pot pouri of creativity. In between there are some wild dancing which reminded me in some vague way, of Elaine and her “little kicks” dance on Seinfeld. The show elicits audience participation too – a little jumping or waving for those interested. Over all if you like high energy shows, techno music, women in water – you will love this show. If you are claustrophobic or dislike stage smoke you might want to reconsider your visit to the show. But it is worth going to and its money well spent. The show has been playing internationally. 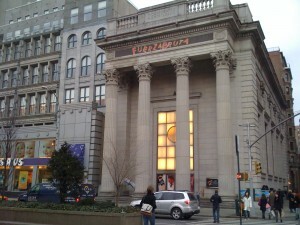 In New York it is playing at the Daryl Roth Theatre. This is a little away from the cluster of Broadway theatres which is closer to Times Square. There is no show on Mondays and Tuesdays. Daryl Roth Box Office timings – Tuesday – 1 – 6 P.M.
Wednesday to Friday – 1 – 8 P.M.
Saturday – 1- 10 P.M.
Sunday – 1- 7 P.M.
Fuerzabruta Ticket rates – $75 (a limited number of $25 tickets would be sold at the box office window two hours before the show time). The Fuerzabruta cast includes Freddy Bosche, John Hartzell, Daniel Case, Hallie Bulleit, Dusty Giamanco, Rose Mallare, Jon Morris, Brooke Miyasaki, Ilia Castro, Jeslyn Kelly, Andy Pellick, Kira Morris, Gwyneth Larson, Tamara Levinson. Diqui James is the creator / Artistic Director while Gaby Kerpel is the Music Director / Composer. Diqui James had founded Fuerzabruta in 2002 with many members of his earlier endeavor, De La Guarda.